Acton is a buckskin overo, flashy and bold, more orange than the yellow-cream of others with his coloring. He has four white stocks and black splashed up his legs, speckling his underbelly. His markings also give him a natural-made black mask that runs over his eyes and down to his white muzzle. 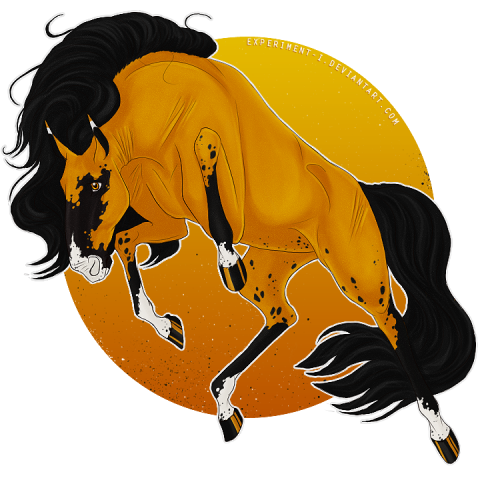 The stallion’s eyes are nearly the same color as his coat, burnt orange or molten gold when he is angry, performing or otherwise high-keyed; a more mellow shade of amber in his calmer moments. 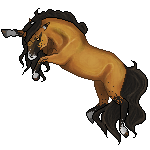 His mane and tail are thick and free-flowing; he can never bear the constriction of braids or pins. It makes performing some of his more daring stunts a bit of a safety concern - but that’s never really been a worry at all for Acton. Not much is, on the surface; his smile is quick to turn to a grin, his eyes are all lively flash, he is never still and rarely quiet. He’s not built like you might imagine an illusionist to be. With his Lusitano blood, he’s solid and muscular. That and his kinetic personality make him impossible to miss in any gathering - a strange trait for a magician thief. But Acton has long been able to make that work in his favor, and his showiness through body and action only better lure an audience - whether one of marks or friends - away from where his true intent lies. There is one more distinguishing factor: a long, thin scar tracing across his right shoulder. It’s ugly and pale and no hair grows over it. It was a warning given when he was a colt - one he’s not quite heeded. Even Acton’s name is strangely prescient, an odd twist of fate. Acton. Act on. From the first he’s been a natural performer, hungry for a laugh or applause - or, later, for money that meant more than both. He has learned how to charm those he’s in the midst of. His laugh is a force in itself, loud and booming and with the full force of his lungs behind it; his smile is quick and dazzling. His eyes, though - they watch you, birdlike, though you may never notice or know what he’s doing with the information. Oh, do not think he has no loyalties. He will always be grateful for the family that Reichenbach has given him, for finding himself belonging to a flock (or a murder) of Crows. He has no qualms about sharing his profits with the Crows; he would quite likely kill for them (and make it seem an accident). But Acton learned from an early age that his first and foremost loyalty must always be to himself. That is the secret he keeps well-buried; sometimes he forgets it himself. That is when Acton is at his best: drinking, laughing, marry-making, wooing whoever might let themselves be wooed by such a showman. But inside him, always, is that anger like a powder keg, waiting for the right word or action (or, perhaps, the wrong one) to ignite it. Of course he never intended to be that way. But there are some things you cannot help, when your childhood shapes you (and scars you), when you are taken advantage of and your inborn honor, even the honor of a gutter-rat, demands it never happen again. And when it is in your very nature to perform, sometimes you lose yourself in the act, and forget who you were in the first place. Acton was born a gutter-rat in a dank warren of a large city some weeks’ travel from Novus. He never learned his father’s name; his mother did what jobs she could to keep them fed. But shortly after weaning, still well before his first birthday, she took ill and never managed to recover. From then he ran with a group of foals not dislike himself, learning to live rough, learning the things that would launch his career. He found he enjoyed performing, as much for the eyes of the audience on him as for the money it brought in, both paid and stolen. His personality, all bright flash, made it easy for the marks to love him, and easier to distract them while a fellow urchin stole away with their valuables. But they were young, and foolish, and it wasn’t long before he was caught for the first time. That first was light enough a punishment: a few days in jail, a verbal warning, and he was out again. The second and the third were nothing; he knew, then, how to distract, how to pick locks, how to slip away. It was the fourth that he best remembers, for that was where he was given his scar: a long, thin, painful reminder of the cost. Not, in his mind, the cost of thievery - but the cost of being caught. He was more careful, after that. The yearling’s tricks improved, his crowds grew, his earnings increased. And Acton - and the others that he worked with - grew greedy. Then came an afternoon, the sky dark and fringed with looming storms, where they performed in a narrow courtyard too near the better parts of town. They’d been active in the area, moving to wealthier marks with each successful show, and Acton and his partner were eager. What he didn’t know was just how eager his partner was. Eager enough to intentionally rob a dangerous mark - a wealthy merchant who’d been watching Acton’s performances for some time. Eager enough to have conspired to sell out the buckskin colt, eager enough to watch him be arrested while his own efforts were paid off handsomely. For a few days, Acton languished in a fortified cell, given no food and grimy water. He thought of only a few things: revenge chief among them. He had seen the way his partner watched him, had spoken to the mark, had slipped away while Acton was arrested. One dusty morning, the merchant came to visit. He had a proposition for Acton. He would free the boy from jail, give him food and shelter, and provide him with a place - a proper place - to perform. In exchange, Acton would let him keep his earnings until his debt was paid. Hungry and young and angry, so angry, Acton agreed. Well, months passed, seasons tumbled on, and the debt was not paid soon enough for Acton. As he tried newer, more dangerous tricks, as he experimented with powders and explosions and all sorts of illusions, he watched his benefactor grow wealthier and wealthier. He did not like to have nothing; he did not like to be controlled. One day, he told the merchant he was going to try something truly dangerous, truly death-defying. A stunt no one had seen before. For a week the show was hyped, papered across the city; the night of the performance, the theater was packed. Even his old partner had found his way into the theater, not to mention the merchant and his friends. Acton’s nerves were a livewire, a powder keg in his gut, but he went out with his smile and his showmanship and the applause was like thunder. But the trick, kept for the finale, went wrong. Had it been an accident, when the powder caught, when the theater became a firestorm, when clouds of smoke made for chaos and only Acton slipped away? Or had it been his greatest escape yet? That’s a truth he’s never told, not even to the Crows. Maybe not even to himself. It was a few months later that he came to Novus, still just a boy on the cusp of three. He told them of himself, he showed them his skills, he earned their trust and they more than earned his own. Now he has a family, and a father-figure in Reichenbach (such a man as he never knew existed). Now his performances are delighted in. Now his pockets are lined with coin. Now he has everything he wanted. There is little enough to it at first. He cannot create the illusion of living things enough to convince the mind, but he can conjure such small items as coins and cards and colored scarves seemingly from thin air. It takes all of his concentration and can only be done briefly – the mirages last for less than a minute, and become more difficult the larger the audience. Acton can convincingly create illusions that mimic living things – birds and deer, though nothing the size of a horse. His smaller illusions, such as coins and cards used in his tricks, now feel physically real, though they vanish once outside a range of about ten yards from him and never last more than half an hour even if he is still present. The more realistic something looks, the more energy and concentration it takes to maintain; he can’t yet do anything too large or numerous. More confident in his magic, Acton can weave convincing mental forgeries, conjuring illusions the size of another horse (though only one animate thing of such size at a time.) He is beginning to be able to trick the other senses along with his illusions – the smell of smoke with the appearance of fire, or of pine if he creates a mirage of a stand of trees. His illusions cannot speak. If tested (if someone runs at an illusion of a wall, for instance) they will shatter, and the large or intricate ones never last more than an hour. Acton’s illusion has grown to the point where he can enchant an audience of dozens for a few hours, or a couple individuals for a day. In addition to conjuring the appearance of figures that are impossible to tell from real objects or creatures unless they’re touched, if he focuses his abilities on one individual he can cast an illusion so thorough as to convince them they’re in an entirely different landscape. Sometimes Acton’s illusions seem to test themselves on his own skin; his eye color might shift from one moment, or the black mask pattern he wears grow or vanish, or new markings come and go.